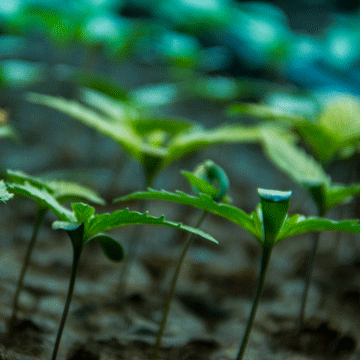 Although germination of cannabis seeds is a relatively fast and simple process, it is important to take into account several important factors for the best germination possible. Also, it is in our interest to germinate the seeds as soon as possible, especially if we want to avoid problems such as fungal infections or low germination rates. There are a few ways you can start your seeds, and these will affect how your seeds grow. Some people will start seedlings by first laying them between two damp paper towels for several days. During this process, the seeds will crack open and roots will form. After these roots form, the seedling needs to be transplanted into a growing medium. If they are left too long, the root can be damaged and the plant may not grow. Another way you can start your seeds are by directly sowing the seeds into the growing medium. This may be a rockwool cube, hydroton, or soil, among other options. If you are directly sowing the seeds into the substrate, make sure to place one seed in each container or cube and keep the substrate damp (not soaking wet, but do not let it dry out!). Place the growing medium under low level lights (an LED light or fluorescent light would be fine) and keep it warm (heating pads are often used). You might not “see” the seed crack open and form its roots, but you should see a little seedling sprout within a week or so. To help you get started with your germination, take a look at Clone Crate which provides kits and sets to help you get started! By placing the seed in a humid medium for breeding, a series of reactions will begin which will lead to germination in a few hours or days. Whatever the substrate for germination has to be chosen, we must ensure that it never completely drains because as seeds stop absorbing moisture, it is very likely that they will cease their activity and will never germinate. It is therefore recommended to check on daily how the glow medium remains damp. Another common mistake is holding on to seeds too long. Over time, the viability of the seed deteriorates, particularly if the seed is not kept in optimum conditions. The seed may peel or lose it’s outer shell. It can also crack. If this happens, germination will be very difficult, and it is very likely that the seed will not grow. Once the seed has sprouted and started to produce a little seedling, we want to move it into a substrate fairly soon. Fluorescent lights will help a seedling get started, but will cause stretching in the seedling over time. However, high powered lights can burn the seedling, so you need to find a safe range of light for the seedling – a T5 Grow Light at about 18-24” distance is a good option. Be careful that the root is not exposed to light for too long. Also, the longer the root is exposed to air and light, it will cause more damage, so it is best to transplant before that happens. This is a common mistake that usually leads to poor germination, especially if the substrate is not watered before sowing the seed. By planting the seed directly into the substrate, we risk burying it too deep, which is even worse if we irrigate the substrate for growth after sowing. If the seedling is too deep, it won’t reach air before it suffocates. In addition, if the substrate is too wet, it can cause root rot on the seedling and the plant will quickly die. 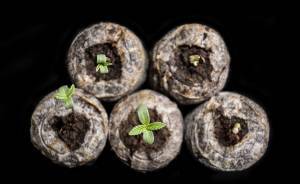 Cannabis seeds generally germinate at relatively high temperatures and humidity. It will be necessary, especially during certain seasons, to use a heat source to achieve a temperature of about 78° F. They should be kept damp (but not sitting in standing water), and warm throughout the germination process. Try using a Hygrometer and Thermostat to track temperature and humidity. 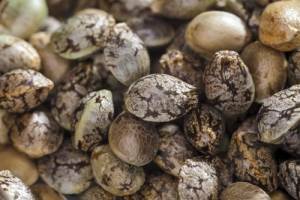 If you look a little closer at cannabis seeds, you will notice that there is a small oval shape, which ends at one point at one end and forms a small “crater” at the other end, called the crown. When your seed is planted or have already begun to germinate the seed with the damp paper towel method, you must keep in mind that this crown must always face upward when planted. Too often, the seeds are buried too deep, so the seedlings can never appear. Alternatively, if we sow too close to the surface, the stem can be weak, turn, or not allow the plant to develop. Seeds should be planted at a depth of ½ inch. 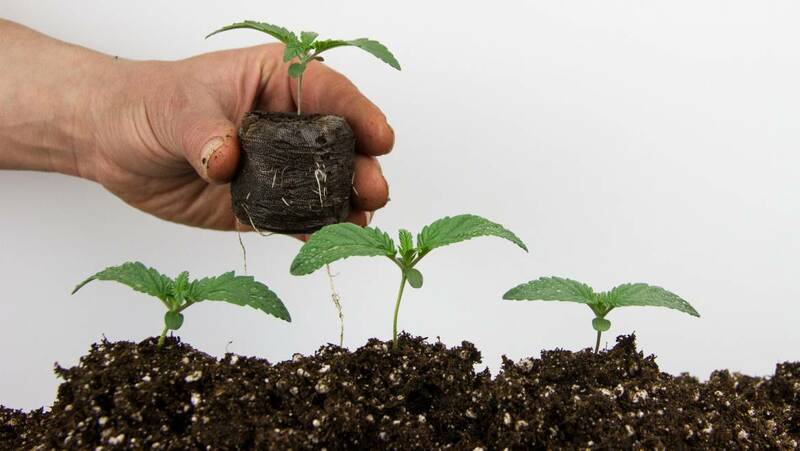 If we then take the seedling from the substrate (such as rockwool, soil pods, or other container) and place it into it’s permanent substrate (such as in the ground or in a container), you must be careful not to bury the plant too deeply. If too much of the stem is placed before the surface, the plant will suffocate. Keep the substrate level close to the existing level of the original plant, no more than an inch above the existing substrate level. Although it may be tempting, germination of several seeds in the same container is generally not successful. In addition to the difficulties of properly planting several seeds in the same pot, they will compete for limited space for their roots after they were born. The seedlings will be competing for resources from the start, which will hinder their overall growth and strength later on. 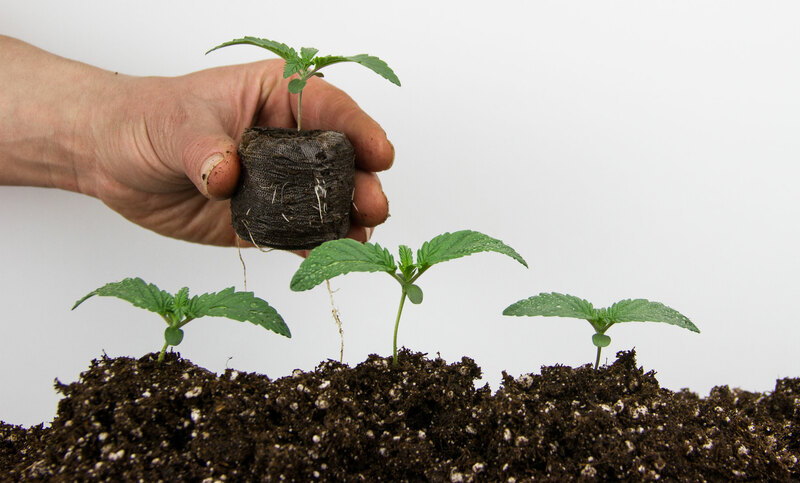 If you are working to ensure that each pot will have a strong plant, you may place 2 or 3 seeds in one container, and then you need to immediately remove whichever seedlings are not performing as expected, leaving you with just one to grow. There is so much to learn when you start growing, but strong, healthy plants take time, knowledge, and careful attention. Contact YourSeedCompany.com if you have any difficulty in your seed planting.